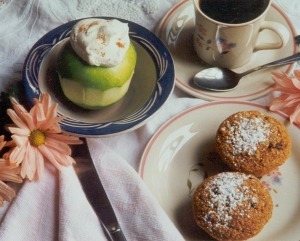 Delicious baked apples, for breakfast! We discovered several years ago that our guests absolutely love waking up in the morning, not only to the smell of freshly baked muffins and coffee, but to baked apples with our very own maple syrup. We use Vermont apples whenever posssible, generally Early Macs because they ripen in mid-August through early September, which is perfect timing for our fall vacationers. Or, if our guests prefer a more tart apple to offset the sweetness of the maple syrup, we use Granny Smiths. We've perfected a recipe and baking process that results in a simply delicious breakfast. 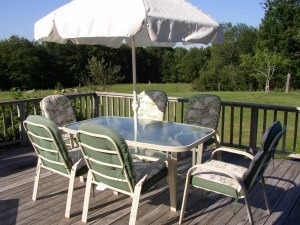 Best of all, when the weather cooperates, you can enjoy your Vermonter breakfast on the back deck, where you can listen to the cows mooing in the pasture. There's just something relaxing about the loud bellow of cows off in the distance. They're actually calling for breakfast too, waiting patiently for Farmer Bill to bring them their morning hay. Sometimes the morning air be a bit brisk until the sun peeks over the tops of the trees and begins to warm the air and burn off the morning dew, but our guests never seem to mind the morning chill. We believe they find it exilerating and great start to the day! Part of the secret to our baked apples is the bowl in which we bake them. Called "apple bakers," these unique bowls have a ceramic post in the center, so that the cored apple will sit on the post and bake perfectly, without collapsing in the bowl during the baking process. Over the years so many of our guests have requested the bowls to take home with them, that we now sell them as well. $19.95 for a set of 2 apple bakers. If you'd like to order you're own apple baker bowls, simply give us a call. We'd be glad to ship them to you. Click here for Rooms & Rates. 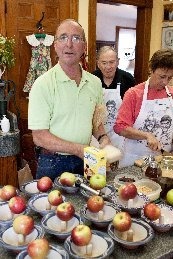 Here's Farmer Bill working hard preparing baked apples for a full bed and breakfast!